(Just) Popped in My Head: Never an SSDD experience! You've heard the expression, "Same Stuff, Different Day," I'm sure. Well, I am fortunate enough to not have that kind of job experience. And, like the other day, I thought I'd share another of my experiences as we go along during the day. First of all, I had to run by a school district so that I could drop off an external DVD +/- drive for the tech to reinstall Windows XP on the Superintendent's mini PC. The other thing I had to do was drop off a jar of caterpillars for the early childhood program. The point is to make it what it needs to be for each teacher/each region - share ideas without worrying about "what's mine" or "what's yours." What is Total Instructional Alignment? It is NOT a rubber stamp, cookie-cutter approach to teaching. It DOES need structure, however. At least a game plan in order to have conversations, for accountability, for testing. Books available are "Total Instructional Alignment" and "Five Big Ideas" - both by Lisa Carter. It is a system AND a conversation - one that each district and/or each co-op should have in order to align standards, curriculum, and assessment; align the system; and align instructional practices (from Lisa Carter). Over today and tomorrow, we are looking at alignment of instructional practices. The TIA Pacing Guides are built in Excel spreadsheets covering Content Standards, learning Objectives, Task Analysis, Z Charts, Essential Vocabulary, Materials/Resources. Don't worry if you have no idea what I'm talking about - I don't even know what half these things are! LOL!! But, these are things that many of the schools in the state are using in order to benefit children across the state. districts are free to make adjustments within the pacing guides based on what they need for their students. I don't like the idea of using Excel spreadsheets for what is basically a database of information. However, because teachers need to be able to move things around using a generally standard application, I have been 'persuaded' that Excel is the most viable solution for easy statewide distribution. Basically, this being developed by non-technical folks for non-technical folks. In the Pacing Guides, the column for "Materials/Resources" is sorely lacking and is the area in which we will focus our attention during this process. 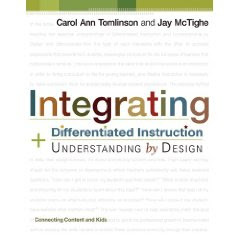 We were told to READ this book: Integrating Differentiated Instruction & Understanding by Design by Carol Ann Tomlinson and Jay McTighe. also recommended reading, "Understanding by Design" by Grant Wiggins and Jay McTighe. The basic premise is that you start with the end goal already in mind. We need to ask the "why" and the "so what" of what we are teaching... WHY are the students reading a particular book and not another book when discussing racial prejudice, for example. Frankly, i asked myself the "WHY" question a LOT in school! Especially in college while earning my Master's degree. seriously, WHY are we reading "Middlemarch" or "Jane Eyre" or whatever. The ultimate reasons usually went along the lines of this: "Because they are the classics." whoop-dee-frigging-doo. I wanted MORE than that. Granted, I did not want too much more. After all, I hated reading for the purpose of trying to figure out WHY the author used a horse instead of a donkey or a cow or an elephant. You know WHY? because he/she WANTED to us a horse. How is a field of horses supposed to 'represent' sexual frustration or desire!? Excuse me!? What whack-job came up with that one!? I don't think so, Tim. I digress.... Back to the topic at hand, there are three stages of 'backward' design: Identify desired results; Determine acceptable evidence; and Plan learning experiences and instruction. Notice this is probably not the way you remember school. Most of us were given an 'experience' or and assignment first. Then, we were told to provide 'evidence' (usually in the form of essays and tests). Finally, we were told what the results should be (usually in form of a grade, and not necessarily the WHY of what was being done). Move from Trivial Pursuit to Essential Questions. For example, move from "How many gargoyles are on Notre Dame cathedral" to "Why are there gargoyles on the cathedral?" Who cares how many there are? It's more about the reasons why they are there in the first place. "Why do people put gargoyles in their gardens?" Let students be involved with their own goals - where are they and where do they need to be? Do they understand WHY they need to be at a certain reading level or math level? Do they need to be at a certain level before they can move to another grade? Are they given the freedom to grow BEYOND those goals if they meet them early? 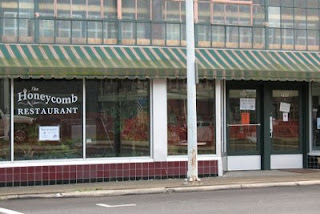 How about a break for lunch? we walked across the way to the Group Living-run eatery. I had Mozzarella sticks, a salad, and a cheeseburger. The burger came on what I believe was ciabatta bread. It was very good. The resources are not prescriptive and not 'have-to' use items, but at least there would be resources available. It gives teachers options. The resources are free and/or state-sponsored, state paid-for. We are not incorporating items for which we cannot get copyright permissions. Resources are captured to the folder holding the resources (on flash drive), so that "no Internet" is NO Excuse. Resources will be broken into Professional Resources for teachers (so the teachers can have resources for themselves), Assessment Evidence, Planning Learning Experiences & Instruction, and Personalized Learning. There is a big push to try and get us push our schools to get interactive white boards (like Smart Boards) in classrooms with Stimulus money. The rest of the afternoon has/had us researching and collecting resources. Tomorrow, we come back to do it some more. And, if you've made this far, I wanted to throw in here that I finished/beat FarCry2 last night! WAHOO! Though, I have to say, the ending was a bit disappointing in my book. I won't ruin it all just yet, but let's just say you don't hunt down the person you thought you were hunting.... Oh, and your character dies in the end. Nice. Okay, so I ruined it for you... You'll be okay. Question: When do women feel it is appropriate to use the men's restroom? Answer: In a room full of 40 people and only 2 are guys. How do i know this? I had to wait in line to use the men's room... And the only other guy was sitting at the table at the time.